Yeah, that's almost how I'd describe the album. Those outside of a very petite, specific slice of the world probably have never heard of Crissi Cochrane. Before her album was slid under my beak of a nose, I wouldn't have heard of her, either. That's just the way it is with independent artists: they fly so far under the radar that it seems they're intentially avoiding your sonar altogether. But Crissi Cochrane is out there... somewhere... probably playing her dog-gone music. I can say, however, that she can't be completely unknown. She has a Wikipedia page, and that says something. So, who exactly IS Crissi Cochrane? She's a folk music artist in her early 20s who, since 2006, has been putting out music in Canada either through very minor labels, or independently, being personally involved in every aspect of production, from the music itself to the packaging. She also travels across the country to perform at various festivals. Crissi Cochrane is busy. And, so it seems, she's pretty alright. The first song from her 2011 independent release is I Won't Try To Break Your Heart, and this may be indicative of exactly what I should expect from the remainder of the album. The title of the song actually fits the song quite aptly, and she reminds us many times over of her innocent intentions. The song itself is a happy blend of folksy instruments -- guitars and the like -- plus a few extra trumpets for good measure. All the elements seem to combine harmoniously, and the track is a bit more upbeat than I would have expected. The next track, Go, is a bit more relaxed and maintains that oceanic yet intimate feel. It's unfortunately not all that memorable in the grand scheme of things, which is too bad because it's obvious there's some heart nestled in there. Now I've heard other songs from other artists called Drive All Night, and they've typically been loud, danceable numbers that make all the fellows and all the ladies wave their little shorts on a scuffed dancefloor. This song isn't that; it's actually another slow one, a mix of acoustic guitar and gruff bass guitar in the background. It was definitely at this point where I found the album's audio to be too loud. My volume wasn't even at 50% and several songs were full of terrible distortion. I know she recorded this in her apartment, but the quality is unsuitable for an official release. She may want to drop the volume or get some mastering done to prevent her work from sounding awful. Next is Never Will, an odd song about her basically Facebook stalking her former lover and how she'll never really get to be with him anymore, even if she's wondering about how he's doing. in his life. The single life is brutal, is it not? It's a nice little catchy tune, although the distortion factor really affects how enjoyable the song is. Fine sounds fine, so to speak. To be honest, I'm not really sure what she's sad about in this one. Is she afraid of commitment? Of the future? Of time itself? Of going to the park after dark? Either I'm the daftest character on the planet or she's just one step too cryptic. While listening, you do get the sensation of laying under the stars, but it's hard to tell if you're happy or not. The album closes with The Needle, and boy, does this sound like a demo that would have otherwise been cut. (But there are only six songs, so I imagine everything she did made the cut.) She definitely affirms her belief in the acoustic guitar here. I don't think there was a song without that. It must be the equivalent of a trusty steed in her musical world. There are also distorted synths on occasion, perhaps the most interesting aspect of the entire song. The lyrics are pretty banal, like the small talk of a small-talk cell phone conversation. I wish that the audio quality had been improved. I know she's an indie artist, but certain parts of the album were really bad. Like, almost Batter Recharger bad. And that was an album delivered with the name of the band physically written on foam and sewn to the rest of the packaging. 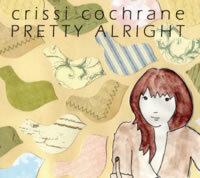 Crissi Cochrane may be a sufficient songstress, but she's going to need a little better recording equipment if she really wants to maximize her sound. A little more variety in her songs wouldn't have hurt, either. As a sidenote, iTunes has categorized her work into the following genres: Singer/Songwriter, Music. Thanks, iTunes, for clearing that up.